Hello. I worked with this program few years ago and created a long tree with all particulars/ Now i tried to open the file and found that all names are written in some unknown language/letters. Original language was Russian. Now i have something like this - Êèðèëëîâíà Ñàõàðîâà. 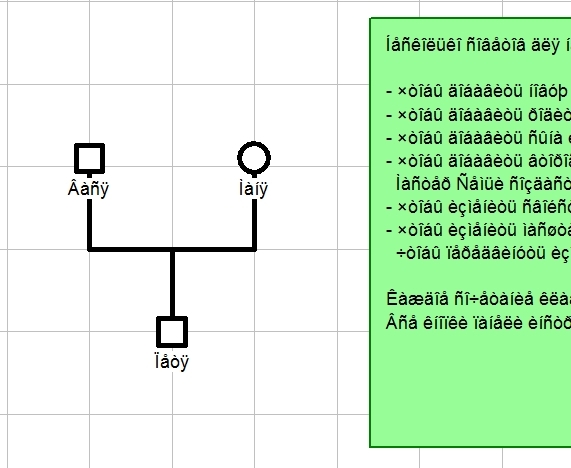 How to transfer the text back into Russian/ I spent many weeks making the tree and searching for family info as from 1700th Help me pls. You can set the language. Try Ctrl+Shift+A to set the automatic language you use. Замените кодировку своего файла на Unicode.